From 1943 until the end of World War II, Stan served as a B-24 Ball Turret Gunner in the U.S. 5th Air Force / Pacific Theater of Operations - 43 Bomb Group / 407 Bomb Squadron. After the war, he attended the University of Missouri and received a BS in Electrical Engineering in 1950. He joined Westinghouse Electric Corporation in 1953, and worked in the Aerospace Division, Balitmore, Maryland, until his retirement in 1986. 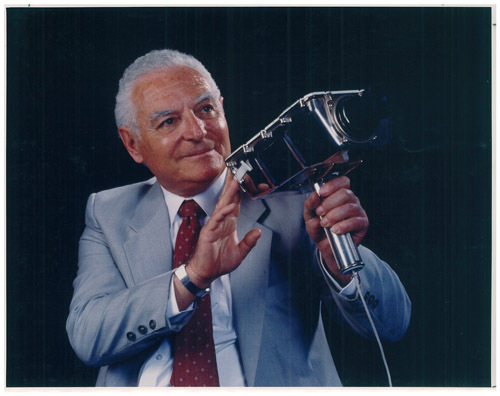 During his Westinghouse career, Stan served as Program Manager of the Apollo TV Lunar Camera which recorded Neil Armstrong's first steps on the lunar surface on July 20, 1969. Subsequent camera programs he managed for NASA were the Apollo Color TV Cameras, the Skylab series of TV cameras, and the TV cameras for the Apollo-Soyuz U. S. -Soviet Cooperative Space Program (ASTP). The four on-board flight TV cameras were designed to operate and transmit from both the Apollo and Soyuz spacecrafts and capable of being remotely controlled from earth when operating in either spacecraft. The ASTP launch of the Apollo spacecraft was the first time that an on-board Command Module flight TV camera provided a live telecast of the astronauts from the moment of launch and continued throughout the launch phase. In addition, Stan was tasked to coordinate the worldwide television transmission for the TV signals transmitted from the Soyuz and Apollo when received in the Soviet Union and the United States. The signals were processed to satisfy the worldwide formats and retransmitted to the worldwide audience. In 1986, Stan retired from Westinghouse as a member of the Program Management team that successfully completed and launched an Air Force Satellite Special Program. Stan is the founder and first president of the Friends Anne Arundel County Trails. He is the Manager of the Planet Walk program to create a Linear Solar System Museum on the B&A Trail where the 3.7 billion mile solar system including the Sun and nine planets are located on the trail and scaled to a distance of 4.6 miles. The Planet Walk is designed as an educational tool for students of all ages. "As many of you know, Dad has been fighting lung cancer for the past 17 years. 2 1/2 weeks ago he had a right lung lobectomy. He came home and was recovering very nicely. Unfortunately he suffered a cardiac arrest and died at 1:30pm today USEST). he wanted me to notify (his friends in the space community) as early as possible ... He lived his life on his terms and with a great sense of humor. Thank you for being his friends.